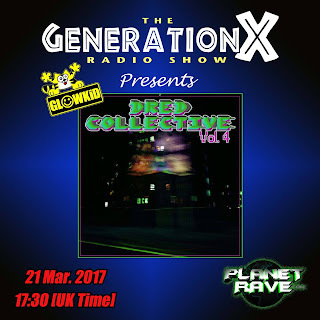 This show was recorded as broadcasted live @ Planet Rave Radio on 21st March 2017 - presented & hosted by GL0WKiD. Live streaming from Athens/Greece. It's been 2 years since my last strictly and direct tribute to the bass label of Dred Collective and its 3rd compilation alongside an interview with co-founder, Neil Pruden. After a good series of EPs, the London based label, has recently released the 4th chapter of its albums including 27 class tunes of Jungle/Acid/Techno/Bass/Footwork, presented by 27 talented producers from 9 different countries, aiming to cover different aspects of Rave! Worth also to mention, that this compilation has officially reached 6,000 downloads on its first week of release, hence it was a pleasure organizing this special showcase for this album. Enjoy the recording on the link above, tracklist included and what remains is giving some love to the whole project of release, so can give extra force to the label and the producers to keep their good work!